Here’s my contribution to the #Berrylove Bloghop this month. Our farmers markets in San Diego are flooded with gorgeous local strawberries. My favorites come from either Carlsbad or Oceanside, about 20-25 miles north of us. We will tire of endless three-packs of berries in a month or two, but until then, strawberries rule! My recipe for Strawberry-Tapioca Parfaits was inspired from one in a 2009 Gourmet entitled “Fruit-on-the-Bottom Tapioca Pudding”. Not a fan of fennel, I replaced the crushed fennel seeds with my favorite standby, Meyer lemon zest and juice. These cute glasses jumped off the shelf at Anthropologie yesterday, just begging to come home and have me take their picture. I hadn’t tasted tapioca pudding since I was a kid when my mother used to make it for my Dad, who adored it. I had never made it with “real” tapioca pearls, so this was a cooking lesson for me. Larry, my stalwart recipe tester, told me that tapioca pudding was his favorite pudding when he was growing up. Who knew? TIP: It took the tapioca 30 minutes to cool, not the 5-10 minutes described in the original recipe. Use the cooling time to prep and purée the berries. 1. Using a small saucepan, bring the water to a boil. Whisk in the tapioca, reduce heat to a simmer and cook, stirring, until the tapioca turns opaque, about 15 minutes. 2. Whisk in the cream, 4 tablespoons of the sugar and the pinch of salt. Continue cooking until tapioca is cooked through, about 3 more minutes. 3. Transfer tapioca pudding to a metal bowl and submerge bowl into a bowl of ice water to quickly and completely cool the pudding. This will take about 30 minutes. 4. Using a food processor, pulse the prepared strawberries, lemon zest, lemon juice and remaining 2 tablespoons of sugar until coarsely puréed. 5. Divide the strawberry purée among 6 six-ounce glasses. Top each serving of berries with a layer of the cooled tapioca pudding. 6. Chill the parfaits in the fridge until cold, about 1 hour. Gorgeous photo Liz!!!! Our strawberry season has almost ended here now. I just processsed a flat yesterday 🙂 Love this recipe and am going to try it too. Thanks, Wendy – could you hear me cursing trying to keep the sides of those little glasses clean for their beauty shot? Very vibrant and colorful photo, Liz! And I like the angle you used to capture the strawberry parfaits, too. 😛 It has been years since I’ve made anything with tapioca in it, even though there’s a package in the pantry. Any chance you know what the shelf life is on tapioca pearls? No date on my package, Kim – I would bet they are kind of like rice and last a long while. I must have seen those glasses of yours Tuesday – no wonder I bought them! Lovely picture! Looks good, I’ve not ever used tapioca before, only had the canned variety as a kid! Gorgeous!!! Tapioca is one of Freddy’s favorite desserts, too. Maybe I will make this for him. I was in Anthropologie just a few days ago…I love that store! It was a little “fiddly” as Nigella says, but only because I had never used tapioca pearls before. SO beautiful! I love the contrasting layers 🙂 Great #berrylove post!!! Thanks – I need to look you up and follow more closely. Beautiful recipe and photo, Liz! The red of the strawberries is so luscious! And love the glasses – they’re perfect for a dessert like this. Isn’t it fun how we continue to learn new things about the loved ones in our lives? Liz – love the sub with meyer lemon – one of my favorite ingredients! Also – you did well at Anthropologie. I adore their stuff — have so far not let myself splurge but I need some new props to inspire me. Carol has their adorable berry baskets – almost bought those myself. Love the strawberries laying on the table. I almost bought some of those baskets too! 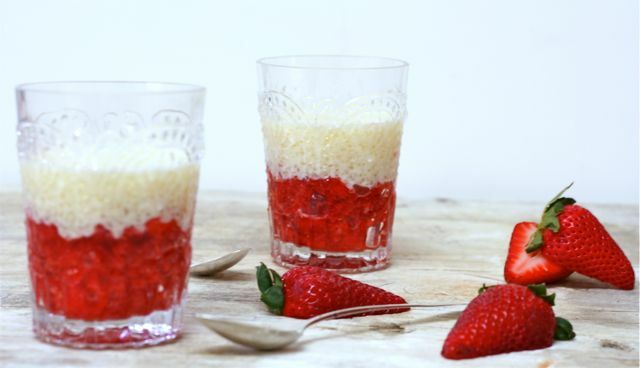 So pretty and I love tapioca pudding but have never made it, who knew it is so easy to make. This is fresh and creamy just the perfect light spring dessert. I never grew up eating parfaits, so I forget about them. What a lovely thing to make for someone you love. Just a little bit of tasty beauty that you can lushly eat with a spoon. Parfaits are going to be a part of my summer table for sure. Thanks for writing this post. This photo is yet another reason why someone needs to invent lick-a-vision soon! Are you supposed to drain the water after the tapioca has simmered for 15 mins?